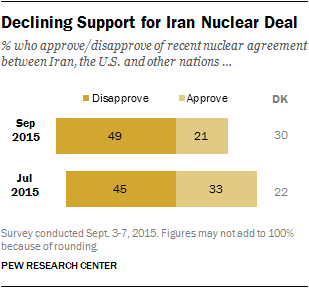 As Congress prepares to vote on the Iran nuclear agreement, public support for the deal has declined. Currently, just 21% approve of the agreement on Iran’s nuclear program reached between the United States, Iran and other nations. Nearly half (49%) disapprove of the agreement, while three-in-ten (30%) offer no opinion. In mid-July, a week after President Obama announced the deal, 33% of the public approved of the agreement, while 45% disapproved and 22% had no opinion. Over the past six weeks, the share approving of the agreement has fallen 12 percentage points (from 33% to 21%), while disapproval has held fairly steady (45% then, 49% now). Somewhat more express no opinion than did so in July (22% then, 30% now). The latest national survey by the Pew Research Center, conducted Sept. 3-7 among 1,004 adults, finds that the contentious debate over the Iran agreement has not resonated widely with the public. In fact, the share saying they have heard either a lot or a little about the agreement has declined from 79% in July to 69% in the new survey. The share saying they have heard “nothing at all” about it has increased nine percentage points, from 21% to 30%. Republicans are far more likely than Democrats or independents to say they have heard about the agreement, and these differences have widened since July. Today, 86% of Republicans, 69% of Democrats and 63% of independents have heard at least a little about the nuclear agreement. Since July, the percentage of Republicans who say they are aware of the agreement is unchanged (84% then) while declining nine percentage points among Democrats (78% to 69%) and 14 points among independents (77% to 63%). 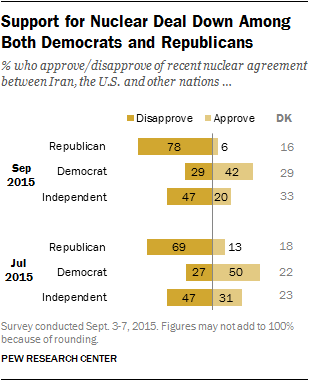 While the partisan divide over the nuclear agreement remains substantial, support for the deal has slipped across the board since July. Currently, 42% of Democrats approve of the agreement, while 29% disapprove and an identical percentage has no opinion. In July, 50% of Democrats approved, 27% disapproved and 22% had no opinion. Republican support for the agreement, already low, has dropped even further (from 13% to 6%). Independents’ support for the agreement also has fallen (from 31% to 20%), although – as with Democrats – the share disapproving has held steady since July, at 47%. When opinion about the Iran nuclear agreement is based only on those who have heard a lot or a little about the agreement, opposition to the agreement exceeds support by more than a two-to-one margin (57% to 27%). Among those aware of the Iran deal, the share approving of the agreement has declined 11 percentage points since July, while the percentage disapproving has risen nine points. The public continues to express little confidence that Iran’s leaders will live up to their side of the nuclear agreement. Just 2% have a great deal of confidence that Iran’s leaders will abide by the agreement, while another 18% say they have a fair amount of confidence. About seven-in-ten (70%) say they are not too confident (28%) or not confident at all (42%) in Iran’s leaders. These views are largely unchanged since July, though the share expressing no confidence at all in Iran’s leaders to abide by the agreement has risen slightly (from 37% to 42%). The public remains somewhat more confident in the ability in of the U.S. and international agencies to monitor Iran’s compliance with the agreement. 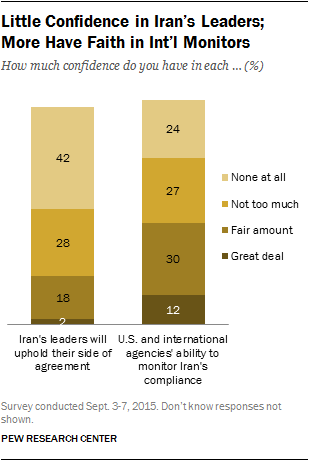 Currently, 42% say they have a great deal (12%) or a fair amount (30%) of confidence in the U.S. and international agencies to track Iran’s compliance, which is little changed from July (46% at least a fair amount of confidence). Since July, the share of Democrats expressing at least a fair amount of confidence in Iran’s leaders to live up to the deal has slipped eight percentage points, from 41% to 33%. 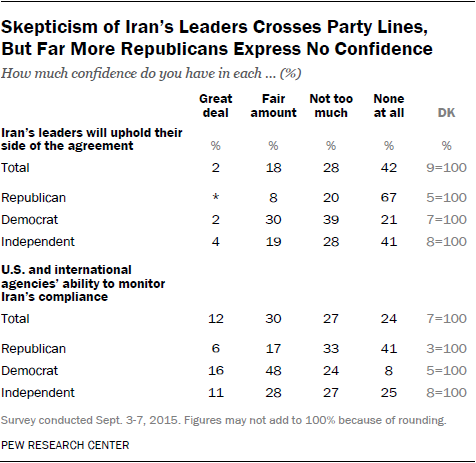 Just 8% of Republicans have that level of confidence in Iran’s leaders, which is little changed from July (9%). But since then, the proportion of Republicans who have no confidence at all in Iran’s leaders to abide by the agreement has increased 11 percentage points (from 56% to 67%). A majority of Democrats (64%) say they have a great deal (16%) or fair amount (48%) of confidence in the ability of the United States and international agencies to monitor Iran’s compliance to the nuclear agreement. Fewer than half as many Republicans (23%) say they are confident in the ability of the U.S. and other nations to ensure that Iran is living up to the agreement. These opinions are little changed from July. Since July, support for the Iran nuclear agreement has fallen across most demographic groups, though in many cases, the share who disapproves has not changed substantially. Among adults with no more than a high school education, for instance, just 14% approve of the nuclear agreement, while 51% disapprove; roughly a third (35%) do not express an opinion. Since July, approval of the agreement has fallen 13 percentage points among this group (27% then), but disapproval is largely unchanged (50% then). The share not voicing an opinion has risen 12 points (23% then). 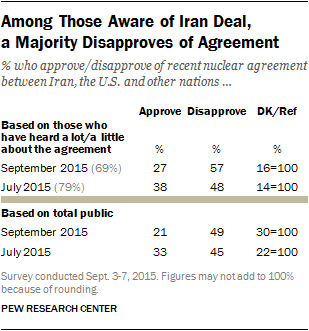 College graduates, by contrast, have mixed opinions of the nuclear deal (35% approve, 40% disapprove). In July, somewhat more college graduates approved of the agreement than disapproved (44% vs. 37%). As was the case in July, people who have heard a lot about the Iran nuclear agreement are more supportive of it than those who have heard less about it. Still, among those who have heard a lot about the agreement, just 34% approve, down nine points from July (43%). Support for the agreement has fallen even more among those who have heard a little about the Iran nuclear agreement (34% to 20%). Notably, while overall Democratic support for the Iran nuclear agreement has slipped since July, there has been no change among the 33% of Democrats who have heard a lot about the deal. Fully 76% of Democrats who have heard a lot about the agreement approve of it, while just 16% disapprove; that is virtually the same as in July (74% approve vs. 17% disapprove). Among Republicans who have heard a lot about the agreement, 90% disapprove of it, which also is little changed from July (84%). 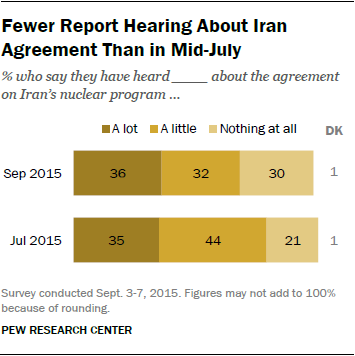 While the share of Americans with at least some awareness of the nuclear agreement has declined 10 percentage points since July, there has been almost no change in the share who say they have heard a lot about it (35% then, 36% now). Republicans (49%) are far more likely than Democrats (33%) or independents (36%) to say they have heard a lot about the agreement and that gap appears to have widened somewhat since July. In terms of overall awareness of the agreement, the decline is particularly pronounced among those with no more than a high school education. 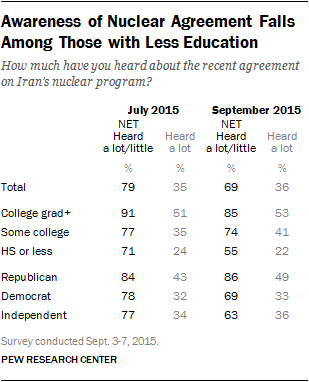 In July, 71% of those with a high school degree or less education said they heard at least a little about the Iran nuclear agreement; today 55% report hearing about it. There has been less change in awareness among adults with more education.